You’ve probably heard the expression “My Goodness, is that the time? 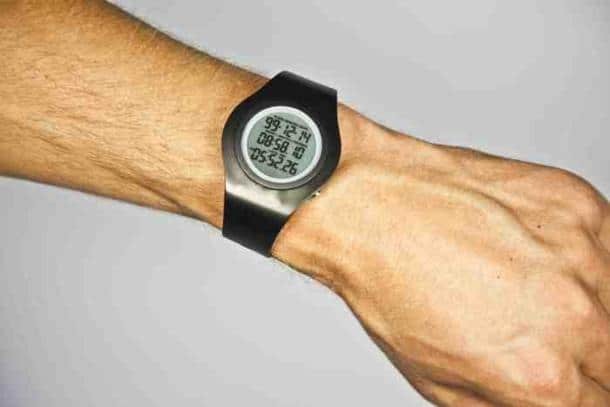 I must be Going!” With this new wrist watch, you may still be saying that, but you may be “going” to the after-life. It’s a watch that countdowns to when you will die. Nice. At anytime you can’t glance down and see how many more years, months, days and hours you have left on earth. The Tikker, or “death watch” if you prefer counts down how much time you have left until Mr G. Reaper Esq parks his cloak and scythe in your passage and awaits you to complete your final preparations for paying the Ferryman. You may remember that there was a website that did the same thing, well here you have your life-line there on your wrist. Tick, tick, ticking away your span of life, like one of the Three Fates. How do you “wind up your life into the watch in the first place? There’s some bureaucracy. Yes, even planning for death requires you to fill out a questionnaire with information about your medical history, weight, lifestyle details such as if you drink or smoke and how often you exercise. Add to that information about any diseases that may run in your family, plus any predictions given to you by de facto claivoyants, seers, sages, and horoscopes. All these are factored in, and number-crunched and hey presto! You are given a score representing your entire lifespan including the years you have already lived or squandered. After your current age is deducted from this score, the Death watch is primed and the countdown to mortality commences. The manufacturers claim that this is an uplifting accessory. It’s not about how much time you have till you shuffle off this mortal coil, but is an encouragement to do great things with the time you have left. How it makes you feel if you’re waiting for hours in an airport terminal waiting for the fog to clear whilst your life is visibly ticking away seems no fun at all. But at least it’s cheap. Not life, I mean the watch. $40 for a basic design and up to $1000 for a custom designed one. Hurry… The grains of time are slipping away…. Not sure if you get a refund if you die before your allotted time!